My 2012 New Year Nails are simple and sparkly! Like I said, it goes with my favorite sparkly gold shoes which I recently bought! 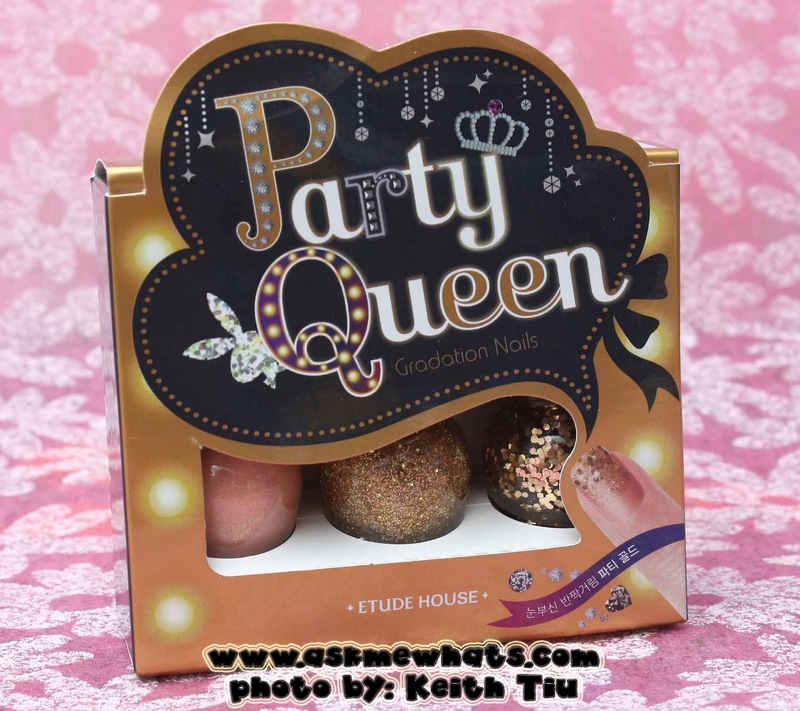 To those who wonder, this is how the Etude House Party Queen Gradation Nails set look like! I'm ready to review this after having this on my nails for almost 2 weeks! EH Party Queen is mostly "GOLD". The base coat is a light peachy pink polish with sparkly gold sheen. The second polish is a simple glittery polish with finer specks of gold as opposed to the regular gold polishes we can find in other drugstore brands. The third and the last polish to finish the gradient nails is the most unique of all! Reminded me so much of a Deborah Lippman chunky polish that blogger friend Mhean gave me during my visit in Singapore! Cute packaging. Both the carton and the bottle! The bottles reminded me so much of Anna Sui. Though mostly written in Korean, the picture instructions are clear enough! All 3 shades are consistently good. All of them pigmented enough. The polish set can last IF set with a good top coat. Simple gradient nail art that looks like you had it done in a professional salon. The glitters are super shiny! Even after more than a week! Nail polish application newbies will still find this difficult to use. The third polish (with chunky glitters) can be rough to touch even when set with a clear top coat. It takes time to get used to it. This set reminded me so much of the BW gradation polish set my best friend bought for me in Hong Kong. Both have the same polish base and glitters BUT the Etude House Party Queen is unique because of it's round, chunky glitters that shines even after you had the polish on for almost 2 weeks! Always use a protective base coat of your choice to protect your nails from yellowing. My favorite is the ZOYA base coat. Always top your nail art designs or plain nail polish with a top coat to keep it shiny and protect from chipping. Wait for each polish to completely dry before you top the next one. Feel free to use the glitters on top of a different polish shade which you currently own to have variety! To remove the chunky glitter, you can leave a cotton pad with nail polish remover on top of the chunky glitter and gently push with a nail stick. At Etude House stores for less than Php348.00 (approx $8.00). Once the base color is COMPLETELY dry, starting at the middle portion of your nails, apply the 2nd glittery gold color with a light, feather-like stroke. Feel free to add more if you like. Once you're done, make sure the second polish is completely dry and proceed with the chunky glitters. A bit tricky to apply at first but I like applying it with a "patting" motion. Try to concentrate more gold glitters on the tip of your nails. Stop, look and re-apply more if needed! Voila! Sparkly gold gradient nails you don't need any extra sponge or makeup sponge applicator during application! The easiest gradient nails I've done! Are you willing to try Etude House's Party Queen polish set? @Marge Yeah! I saw it, pero sis, still!! mas mahirap siya than others! hahahhah :) Thanks for sharing! @Angela Ang ganda niya! I don't usually leave my gradient nails as is, I'm usually inclined to do kahit simple nail art, with this, I'm ok na! @Issa Like me? *bats eyelash* hahahahha bonggang Happy new Year! Looks great, but I know what you mean you mean about removal! i love EH's gradient nail sets so I will definitely be purchasing this one. problem is lagi sila out of stock!! !